Homer Griffin was born on 21 April 1822 at Suffield, Hartford Co., CT. He was the son of Oliver Griffin and Achsah Viets.2 Homer Griffin married Susan Jane Griffin, daughter of Aristarchus Griffin, on 16 November 1843. Homer Griffin died on 14 July 1893 at Copper Hill, East Granby, Hartford Co., CT, at age 71. Homer and Susan were enumerated in the 1850 Granby, Hartford Co., CT, federal census, in the household of Horace Viets. Homer was 28, she was 28. Also enumerated were children Ellen 4, and Jefferson 2. Homer and Susan were enumerated in the 1860 East Granby, Hartford Co., CT, federal census. He was a farmer, age 38, she was 38. The only child in the household was Ellen J. 13. However on the next page of the census, in a household of Horace Viets, 76 were Jefferson H. 11, Lauren 8, and Martin W. 6. Homer and Susan were enumerated in the 1870 East Granby, Hartford Co., CT, federal census. He was a farmer, age 48, she was 48. Children in the household were Jefferson H. 21. Flora S. 19, Martin @. 16, and Burton L. 3. [S239] Dororthy Dean Viets Schell, Viets Female, Page 23. [S208] Dorothy Dean Viets Schell, Viets, Page 40. Susan Jane Griffin was born on 3 May 1822. She was the daughter of Aristarchus Griffin. Susan Jane Griffin married Homer Griffin, son of Oliver Griffin and Achsah Viets, on 16 November 1843. Susan Jane Griffin died on 19 June 1907 at age 85. Genie Laura Griffin was born on 28 September 1874 at West Suffield, Hartford Co., CT. She was the daughter of Jefferson Homer Griffin and Amanda Louise Spring.2 Genie Laura Griffin died on 20 June 1946 at age 71. [S239] Dororthy Dean Viets Schell, Viets Female, Page 24. [S422] Jr. Winfred R. Goddard, Goddard, Page 82, item 38185. Clayton Weston Griffin was born on 14 November 1883 at West Suffield, Hartford Co., CT. He was the son of Jefferson Homer Griffin and Amanda Louise Spring.1 Clayton Weston Griffin died on 21 September 1888 at age 4. Arthur and Gladys M. were enumerated in the 1930 East Granby, Hartford Co., CT, federal census. He was a truck driver. Children in the household were Gerald 12, and Paul H. 7. [S422] Jr. Winfred R. Goddard, Goddard, Page 83. [S182] Social Security Death Index (on-line), Ancestry.com, SSDI, Ancestry.com, SSAN 045-10-4338. Paul Herbert LaPlant was born on 28 December 1923. He was the son of Arthur J. LaPlant and Gladys Marion Griffin. Paul Herbert LaPlant married Mary Antico. 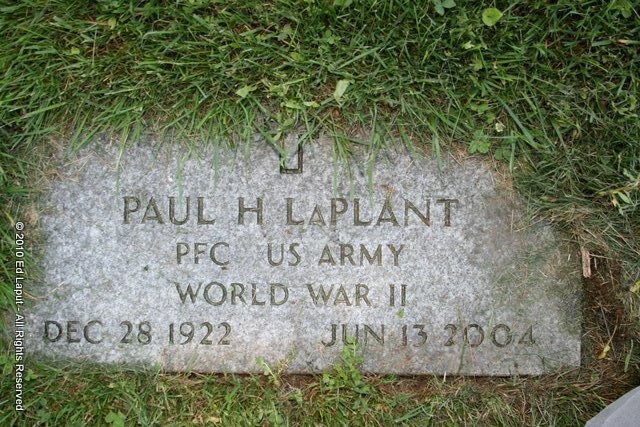 Paul Herbert LaPlant died on 13 June 2004 at age 80. He was buried at Copper Hill Cemetery, East Granby, Hartford Co., CT.
Everett Homer Spring was born on 8 August 1876 at Granby, Hartford Co., CT. He was the son of Lewis Cass Spring and Flora Susan Griffin. Everett Homer Spring married Bessie M. Burlingham, daughter of William Burlingham and Maria J. Stoughton, on 30 October 1905. Bessie M. Burlingham was born on 29 May 1883 at Whillimantic, CT. She was the daughter of William Burlingham and Maria J. Stoughton. Bessie M. Burlingham married Everett Homer Spring, son of Lewis Cass Spring and Flora Susan Griffin, on 30 October 1905. 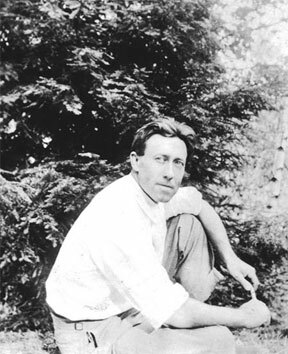 Francis Lewis Spring was born on 26 November 1879 at Granby, Hartford Co., CT. He was the son of Lewis Cass Spring and Flora Susan Griffin. Francis Lewis Spring married Geneva Inez Beeman, daughter of Joseph L. Beman. Francis Lewis Spring died in 1972. 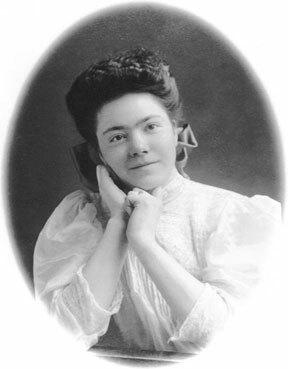 Geneva Inez Beeman was born in May 1881. She was the daughter of Joseph L. Beman. Geneva Inez Beeman married Francis Lewis Spring, son of Lewis Cass Spring and Flora Susan Griffin. Geneva Inez Beeman died in 1969. Harlan G. Spring was born on 22 November 1906. He was the son of Francis Lewis Spring and Geneva Inez Beeman. Harlan G. Spring died on 15 November 1993 at Granby, Hartford Co., CT, at age 86. Susan Mahalia Spring was born on 20 March 1885 at Granby, Hartford Co., CT. She was the daughter of Lewis Cass Spring and Flora Susan Griffin. Susan Mahalia Spring married Charles D. Clark, son of Wesley N. Clark and Emma Lydia Smith, on 17 September 1913. Charles and Susan were enumerated in the 1930, Granby, Hartford Co., CT, federal census. He was a farmer, age 41, she was 44. Children in the household were Rachel 14, and Lois 10. Also in the household was Flora Spring, 79, Edward T. Fermer, brother-in-law, age 56, and sister Julia Fermer, age 45. Charles D. Clark was born on 20 June 1888 at Granby, Hartford Co., CT. He was the son of Wesley N. Clark and Emma Lydia Smith. Charles D. Clark married Susan Mahalia Spring, daughter of Lewis Cass Spring and Flora Susan Griffin, on 17 September 1913. 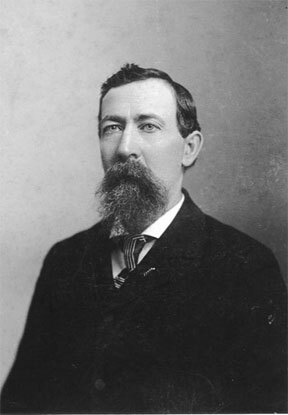 Wesley N. Clark married Emma Lydia Smith. Wesley N. Clark was born on 8 June 1859. He died on 12 May 1944 at age 84. Emma Lydia Smith married Wesley N. Clark. 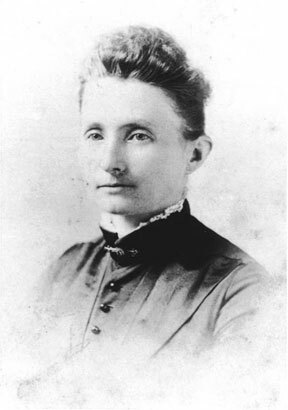 Emma Lydia Smith was born on 8 October 1861. She died on 8 April 1940 at age 78. Charles F. Newton Jr. died on 27 January 1945. Children of Edna Grace Spring and William Rufus Messenger Sr.
William Rufus Messenger Sr. was born in November 1884.2 He was the son of Burt Beman Messenger and Mary Frazier. William Rufus Messenger Sr. married Edna Grace Spring, daughter of Lewis Cass Spring and Flora Susan Griffin. William Rufus Messenger Sr. died on 7 January 1965 at Granby, Hartford Co., CT, at age 80. William and Edna were enumerated in the 1930 Granby, Hartford Co., CT, federal census. He was a farmer, age 45, she was 42. Children in the household wre Miriam 17, Cynthia 15, William Jr. 13, Barbara 9, and Burton 3. Burt Beman Messenger was born in April 1847 at CT.1 He was the son of Seymour Messenger and Sally Beman. Burt Beman Messenger married Mary Frazier. Burt and Mary were enumerated in the 1880 Granby, Hartford Co., CT, federal census. He was a farmer, age 34, she was 27. The only child in the household was Frederic, 1. Mary Frazier was born in August 1854.1 She married Burt Beman Messenger, son of Seymour Messenger and Sally Beman. Steven Lewis Messenger was born in 1911. He was the son of William Rufus Messenger Sr. and Edna Grace Spring. Steven Lewis Messenger died in 1930. [S182] Social Security Death Index (on-line), Ancestry.com, SSDI, Ancestry.com, SSAN 047-30-2741. [S182] Social Security Death Index (on-line), Ancestry.com, SSDI, Ancestry.com, SSAN 031-44-1246.